Los Angeles has a lot of interesting buildings designed by famous names like Frank Lloyd Wright, Frank O. Gehry, Renzo Piano, Richard Meier, Rudolph Schindler and Greene and Greene, and they're scattered all around town. Although it's debatable what makes a piece of architecture significant or interesting, the structures included here are interesting due to their visual impact, historic significance, and accessibility to the public. Frank Gehry's Walt Disney Concert Hall in Downtown Los Angeles was designed to look like a ship sailing down Grand Avenue with its giant silver sails unfurled. One of the best things about the Disney Concert Hall is that you can climb all over it. There are stairways and walkways that allow you to go up and walk around those great sails and get some really cool photos. You can explore on your own or take the free tour. Before he designed the Disney Concert Hall, Frank Gehry also designed the Binoculars Building in the Venice neighborhood of LA. Right next to the Disney Concert Hall is The Broad, which opened in 2015. It's not all that striking on a drive-by. It is said to resemble a big white cheese grater. You have to get up close to really appreciate the "veil and vault" concept of architects Diller Scofidio + Renfro. The white honeycomb covering is suspended over the interior box, letting in natural light, but preventing direct sun exposure to the art within. If you're flying into town, the first structure that will make an impression is the Theme Building at LAX. The space-age building built by African American architect Paul Williams in 1961 was most recently home to the Encounter Restaurant, but is in flux until another tenant takes over. While the restaurant is closed, the observation deck on top is only open on weekends. Paul Williams was also responsible for the circular Founder's Church of Religious Science, the expansion and current look of the iconic Beverly Hills Hotel and bungalows, and the elegant interiors of the original Saks 5th Avenue in Beverly Hills. He also collaborated on the LA County Courthouse in Downtown LA and designed over 200 homes in the LA area. The Petersen Automotive Museum reopened in late 2015 after a complete makeover, instantly becoming one of LA's most striking buildings. The exterior, by Kohn Pedersen Fox Associates, is made up of 308 metallic stainless-steel ribbons wrapped around the red-painted box building. Most people don't notice in passing, but if you look at the building from the opposite corner of Wilshire and Fairfax, you'll get the view above, where you can see the shape of a race car careening around the corner. It looks great during the day, but under a twilight sky when it's lit from the inside, it's really stunning. Richard Meier's Getty Center looks like completely different buildings, depending on your vantage point. You usually see views of the squared-off travertine stone facade or inner fountain, but I love the sensual curves of the main entrance, covered with off-white enameled aluminum panels. You can't really get a good drive by view of the Getty Center on it's hilltop perch in Brentwood. You have to pay the $15 parking fee, then take the tram up. The museum and the architectural tour are free. Grauman's Chinese Theatre, now renamed TCL Chinese Theatre, is rarely mentioned in lists of top Los Angeles architectural sites, but Raymond M. Kennedy's 1927 movie palace is arguable the most famous and definitely the most visited architectural landmark in the city. Working for the design firm of Meyer and Holler, Kennedy was responsible for 99% of the theatre's sketches and design details. While he never gained the prominence of some of LA's better-known architects, Kennedy's architectural influence continued in a different direction when he became a professor of architectural design at the University of Southern California. teaching architects who went on to win notable awards. His own architectural projects were as diverse as designing movie sets and working as a consultant for the design of the Pentagon in Washington DC. You can drive by, stop and take a closer look, take a Chinese Theatre Tour, or take a Red Line Behind the Scenes Walking Tour. The Capitol Records Building near Hollywood and Vine was designed by architect Welton Becket in 1956 to resemble a stack of vinyl 45 records. It is one of the most recognizable structures in the city. The 13-story tower is on the Los Angeles Register of Historic Places. You can't really visit the Capitol Records Building unless you have business there, but you can certainly see it and photograph it from the street from Vine Street, just north of Hollywood Boulevard. Welton Becket also designed the three original buildings of the Los Angeles Music Center. Cesar Pelli's boldly colored geometric Pacific Design Center in West Hollywood was built in stages over nearly two decades. The Blue building opened in 1975, and the Red building has only been open since 2012. The 14-acre campus is a showcase for the interior design trades, but also has some public galleries and lots of public art. You can photograph the outside as much as you want, but taking photos inside is discouraged. 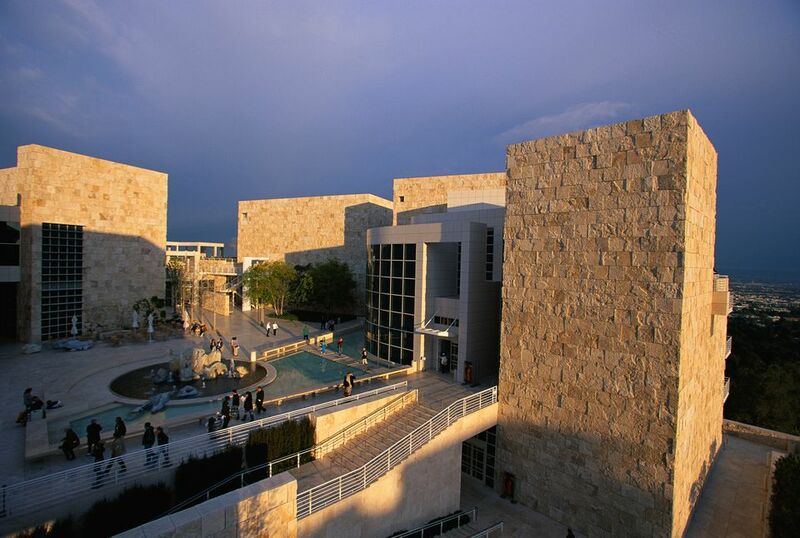 The Pacific Design Center also has a satellite of the Museum of Contemporary Art that is free to visit and a courtyard fountain that is great for catching late afternoon rainbows. The unprepossessing brown brick exterior of the Bradbury Building (304 Broadway at West 3rd Street) in Downtown LA, doesn't hint at its spectacular interior. Unlike the buildings on the previous pages, this is not one that you can appreciate on a drive by. You have to take the time to park and go inside, where intricately carved wood and wrought iron filigree are lit from above by a domed atrium. The building was designed originally by Sumner Hunt and embellished upon by one of his draftsmen, George Wyman, as a commission for gold-mining millionaire Lewis L. Bradbury. Bradbury died before the building was finished, but his inspiration, based on an 1887 science fiction novel, has become a National Historic Landmark. It is the oldest commercial building remaining in Downtown LA. You can walk through the Bradbury Building on your own and take a look or learn more about it on the LA Conservancy's Historic Downtown Walking Tour. Los Angeles is full of beautiful Craftsman houses, but the Gamble House in Pasadena, designed inside and out by brothers Charles and Henry Greene is the cream of the crop. The house was built in 1906 as a summer house for David and Mary Gamble of the Procter and Gamble Company. The house incorporates Japanese elements into a Swiss chalet framework using craftsman techniques. Every detail in the house from the peg wood paneling to the stained glass windows was designed by the brothers, with Charles being responsible for more of the interior details. The Gamble House is now a museum that can be visited on scheduled tours. Select architecture students from USC get to live in the house as part of an architect in residence program. Greene and Greene built a number of fine Craftsman homes in the area and a map is available in the gift shop at the house. You can also see Green and Green furnishings on display at the Huntington Library and at the LA County Museum of Art. 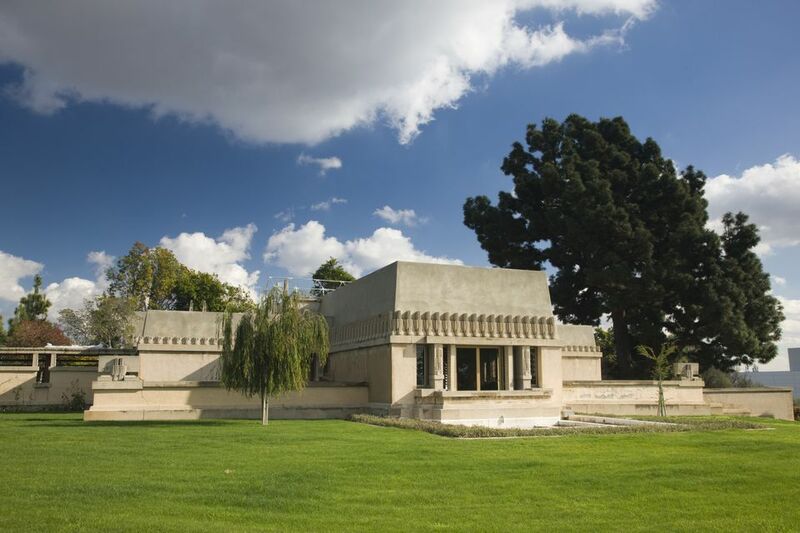 The Hollyhock House on Olive Hill was designed by architect Frank Lloyd Wright to be the home of oil heiress Aline Barnsdall, but she never actually lived in it. She was so discontented with how it turned out, that she fired Wright and started work on donating it to the City of LA before it was even finished. The house is located in Barnsdall Art Park in East Hollywood. It is open as a historic home museum. The Cinerama Dome (6360 Sunset Boulevard in Hollywood) was designed as a prototype for what was supposed to be a series of dome cinemas around the country, based on R. Buckminster Fuller's geodesic design, but the rest were never built. Built in 16 weeks using 316 interlocking concrete panels, the theatre opened in 1963 with a curved 86-foot wide screen. The 76-foot high dome can seat almost 1000 people. In 2002 Pacific Theatres built up a state-of-the-art 14-screen multiplex movie theatre, ArcLight Cinemas, around the dome, including a restaurant, bar and gift shop. The three-story complex also houses a gym, a nightclub, and retail shops. ArcLight is one of the costliest movie theatres in LA, and you're as likely to see celebrities in the audience as in the movies. The Cinerama Dome originally used a single camera system, but since 2002, it has been one of only three cinemas in the world using a three-camera system. The Cinerama Dome is still frequently used to host movie premieres. Not all films in the Dome are screened in Cinerama using the full screen. Check the Arclight website to see what's playing in the Cinerama Dome. Personally, I think Spanish architect Jose Rafael Moneo's 11-story postmodern masterpiece in architectural concrete looks more like a prison than a church, but the Cathedral of Our Lady of the Angels is certainly a domineering presence towering over the 101 Freeway. The Cathedral does have some interesting artwork, including the towering bronze doors by LA-based sculptor Robert Graham topped by a modern interpretation of Our Lady. John Nava's tapestries featuring a combination of saints and community members line the interior walls. It is the largest collection of hanging tapestries in any Catholic church in the United States. Installed at the end of the south ambulatory of the Cathedral of Our Lady of the Angels is the 1687 gilded, black walnut, Spanish Baroque retablo that was brought to the US in the 1920s, and placed in the care of many temporary homes before being relocated permanently to the new Cathedral in 2002. Viennese transplant Richard Neutra designed the experimental house at 2300 Silverlake Blvd and built it with a no-interest loan from Dutch philanthropist Dr. C.H. Van Der Leeuw. He called it the VDL Research House in honor of his financier. It was his own home and studio. Neutra wanted to demonstrate that even on a small, hemmed in lot he could create a home that allowed private and spacious living. The original 2100 square foot house, built in 1932, was built to the edges of the lot and vertically on two stories to take advantage of the views of Silverlake Reservoir and the San Gabriel Mountains. It was surrounded by fast-growing trees to provide privacy. The garden house was added 7 years later. A fire damaged the main house in 1963, and Neutra and his son Dion, also an architect, built a new house on the original basement in 1964, applying everything they had learned in the intervening years and experimenting again with the latest building technologies. When Richard Neutra's wife Dione dies in 1990, she left the house to California State Polytechnic University, Pomona, which administers the house as a museum. Cal Poly Pomona architecture students give thirty-minute guided tours of the house and its temporary exhibits on Saturdays from 11 am to 3 pm, except for holiday weekends when students are not available.